Buy an iPhone 4 SIM card reader replacement socket. 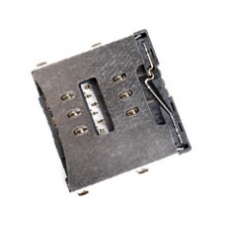 This part is a brand new original Apple iPhone 4 SIM card reader replacement part. If your iPhone 4 is no longer reading SIM cards when inserted into the unit, or displays a NO SIM error message when a SIM is inserted you will probably have SIM card reader pin damage, or SIM card insertion switch damage, if so this is the part to replace. Please note this surface mount iPhone 4 SIM reader component requires soldering skills to install.